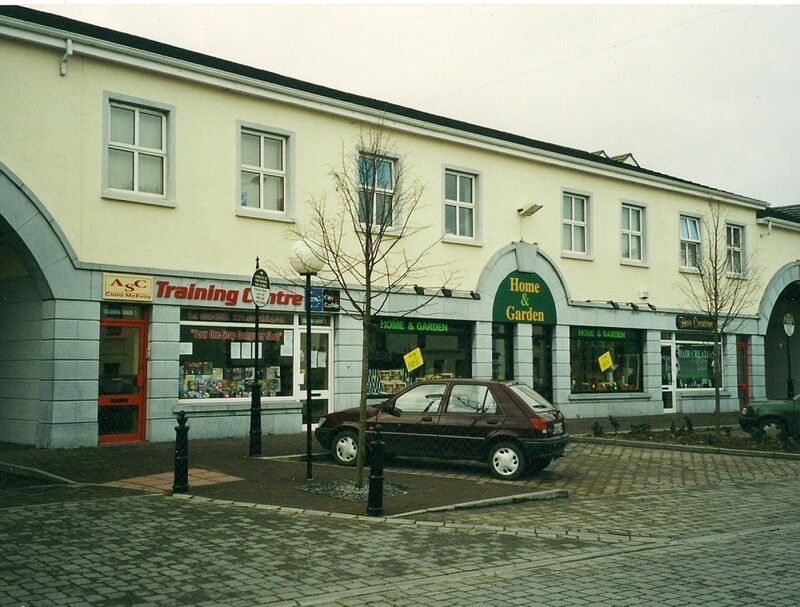 In the early 1990's, the Bridge Street Centre was built on the site of Conroy Brothers Garage - On the crossroads of Ireland. Open 6.30 every morning. All Makes Cars, Trucks, Tractors Supplied and Serviced - which had stood here since 1946. In the late 1960's, the premises also housed The Gleeson School of Motoring and, in the 1980's and early '90's, Hamilton's Motorcycles. For a short while in the mid-1980’s, the yard at the rere held a Saturday Market where you could get everything and anything from cutlery, clothes and LP's, to carpets, toys and Black Cat bangers. And, on at least two occasions in the late 1980's, the area hosted a carnival/funfair. 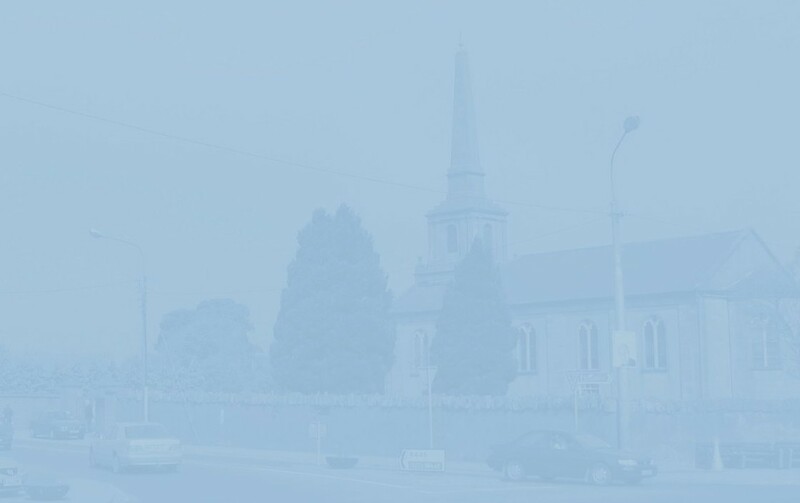 In 1850, five buildings - all leased from Mrs Margaret Lalor - stood on this site. The one nearest the river was the home of Eliza Craig and she was succeeded by Andrew Brennan, Thomas Burgoyne, Bernard McGovern, James O'Neill and, from the 1890's to the 1940's the McCullagh family. In 1901, a young widow, Kate McCulla (sic), listed as a general servant, was living here - one of only four thatched houses in the town - with her son and four daughters. Apart from Margaret the eldest, a dressmaker, all the others were scholars. On Census Night ten years later, Margaret - presumably married - was not present; Mary was now listed as a housekeeper; Hannah a dressmaker, and eighteen-year-old Robert a school teacher1. Also in the house was an older son John, a private in the 4th Leinster Regiment. The next house, in 1850, was occupied by Denis Murray who, in directories from the previous two decades, is listed as a locksmith. It's ironic that he was succeeded here by George Locke, possibly the son of Thomas, a grocer in the town in 1824. According to Eddie Boylan2, a painter by the name of Kenna also lived here but I've been unable to substantiate this. In 1901, Patrick and Kate Dowling were the occupiers. The Census Form is unclear, but it seems that both were retired asylum attendants. Ten years later, the widowed Kate was still here. She kept one boarder, Lizzie Dunne, a young dressmaker. The last leaseholders were John (1920's) and Francis (Frances?) Kelleher (1930's and '40's). They were succeeded by the Foy family who eventually moved to Dr Murphy's Place (the first post-war urban housing scheme completed in County Laois). In the middle of the nineteenth century, the euphonious Nobel Cuffe was the tenant in the third house. About him, I can say absolutely nothing except to speculate that he was somehow descended from a relative of Dorothy Cuffe, wife of Sir Charles Coote (who named his Castlecuffe - two miles west of Clonaslee - in her honour). In 1901, the McGuire family was living here; James and Ellen - car-driver and dressmaker respectively - and their three children; two of them "employed at home", the third a scholar. Also in the household was Mary Coonan, an 86-year-old relation from Tipperary. James and Ellen were still here on Census Night, 1911, as was their son Frank, a car-owner, and three young grandchildren, Myley, Elcie (sic) and Marcella Allaman, all born in America. In later years, Ellen, daughter of James and Ellen McGuire, married James Sheridan, and the last occupant of this house, in the 1940's, was Arthur Laffan, a painter. The next premises, once a small iron foundry run by a John Carty, appears on the 1901 census as a workshop. No occupant's name is given, but Eddie Boylan remembered it being used by coach painters Paul and John Fox from the Stradbally Road. Their father, Andrew, was a coach builder originally from King's County (Offaly today). Intriguingly, their mother's occupation on the 1901 Census Form is given as 'Nest maker' (?) By the 1920's this building was in ruins. In the middle of the 19th century, the fifth building was the home of Charles Jackson, a car and gig maker, and, in the 1890's, English-born carpenters John and Thomas Bryan and their sister Ellen. In 1911, a widow, Margaret Fox and her eight children were living here. Her eldest son Thomas and daughter Norah were master house painter and dressmaker respectively. A boarder, John Vaughan from County Galway, was also a house painter. The names of two female boarders, Mary Managhan, a general servant and Elizabeth Delaney, a seamstress, are crossed out on the manuscript, but appear on the printed page. All of the above five premises were eventually demolished to make way for Conroy's Garage. Cleland's shop (later occupied by Polish shop, Polonez and, from 2017, Clement Herron Real Estate who moved here from No. 109) on the right of the picture stands where Patrick Molloy, a carpenter, lived in 1850. He was succeeded by James Abraham, a painter and glazier who later lived on the New Road, and then the Maher family. In 1901, Michael Maher, an octogenarian cattle dealer, lived here with his son - also a cattle dealer - and his wife and eight young children. 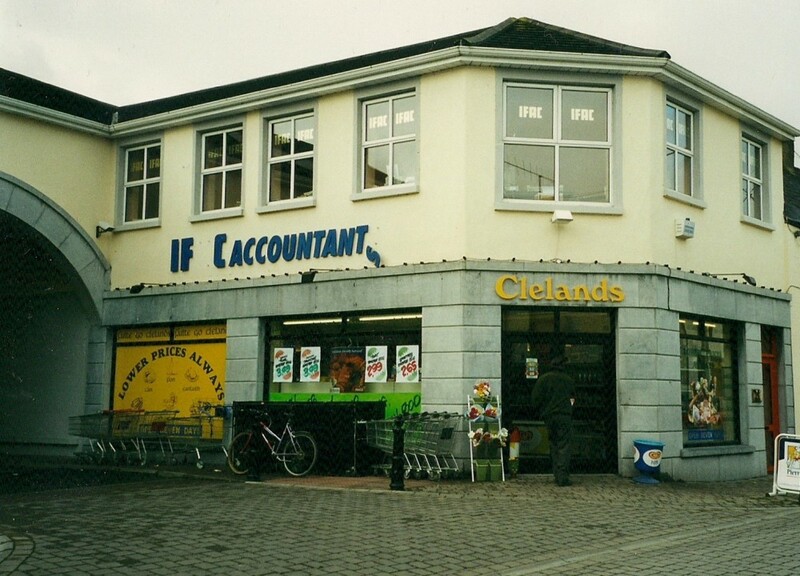 A year later, the building was demolished and replaced by a new one which housed a butcher's shop run by Daniel Kennedy. By 1911, there were two families living here; the Keatings, who we've already met across the street in Number 8, and James Butler, a carpenter, and his wife and family. The Butlers were originally from Waterford. From the 1920's the premises were occupied by the Hanlon family. Mrs Hanlon was a midwife (as was Mrs Keating, her predecessor in the house); her husband Paddy had a bicycle shop. He had a large wall-clock with had no hands and, on its face, the legend NO TICK HERE! For many years within living memory, this was the home of plumber Peter Murray and family. In passing, it's interesting to note the number of house painters who once lived in this part of the town. In recent times, I've heard this side of Bridge Street referred to as Little Warsaw. In 2008, three of the five shops between this one and Donoghues on the New Road corner were Polish. 1 In later years, Robert 'Bob' McCullough worked in the office of Kelly's Foundry which, until the 1980's, stood where the Heritage Hotel is today. 'Kellys the Foundry', as it was always known locally, was one of the county's biggest employers and a veritable institution in the town. The company was particularly well-known for its haysheds which, with their blue-and-white nameplates, can still be seen in many parts of the country. (Those of you familiar with Carrowmore, County Sligo, may have been amused to find one standing beside the largest group of megalithic tombs in Ireland). 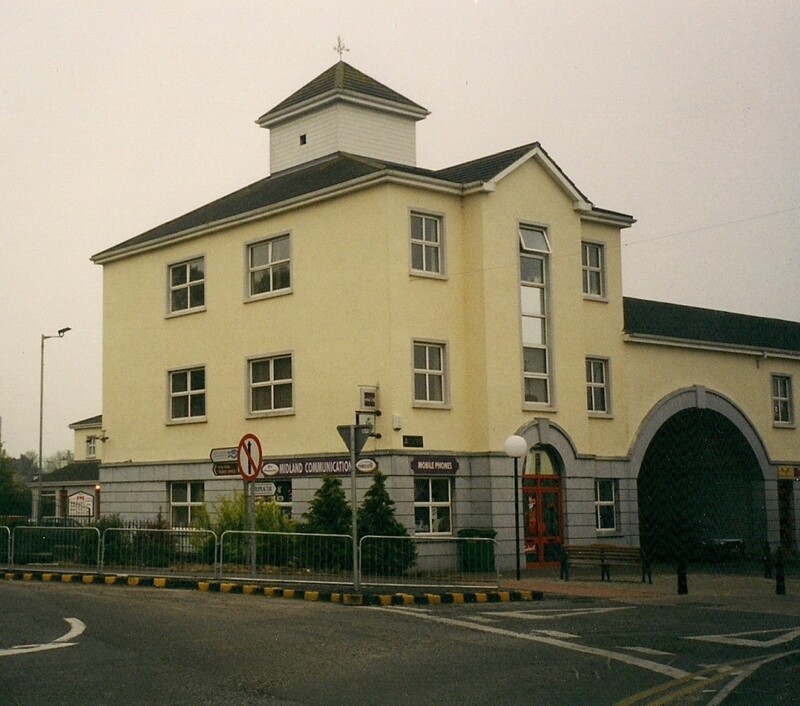 Kelly's site was eventually acquired by Monarch Properties with a view to developing Portlaoise Shopping Centre. This, of course, never happened, and the site lay derelict for a number of years. Today what was once Kelly's Hardware shop is occupied by Wesley Terrace beside the Methodist Church, and all that remains of the foundry itself are numbers on the wall - denoting the lengths of different girders - at the entrance to the Heritage Hotel Fitness Club. One of the hotel's restaurants was called Kelly's Foundry. At the time of writing (May 2014) it had been closed for some time. Patrick Kelly (b.1853) was an R.I.C. man whose hobby was making iron farm implements. He resigned from the force and, in 1883, bought Campbell’s Queen's County Agricultural Implement Works. [Murdock Campbell, who lived at Clonreher Castle, Maryborough, was an interesting character. As well as being a businessman, land agent, and Senior Deacon in the Maryborough Masonic Lodge, he also found the time to do a spot of inventing: in November 1873, The London Gazette reported that he had applied to patent a type of briquette. The journal also gave details of how Mr Campbell intended to manufacture his product]. When Patrick Kelly died in 1929, the foundry business - and others - were continued by his son Thomas. Much more about the Kelly family later. 2 In one of his unpublished notebooks in Laois County Library Headquarters, Portlaoise.